Create a style sheet (thanks for the nudge via your recent blog posts, Ruth) for my patterns. I keep a lot of it in my head, but it would be better to have it articulated in a document that I can share with tech editors. Prep for the Kids Knit class I'm going to teach starting at the end of the month. Thus far three of Isobel's friends (third graders) have signed up to learn to knit. I think it will be really fun, and it's always good to create more knitters. Create a newsletter. I signed up on MailChimp a while ago and have been totally putting it off. Consolidate all of my little sketch notebooks, whether this is into one big notebook or into the digital realm is yet unclear. Much of the time I am inspired by my stash and tend to design things that I want to wear and/or that fill a need in my wardrobe. But that doesn't have to exclude pursuing yarn support options. Prep for my book group dinner at the end of the month. I may have spent quite a while with Julia Child's The Way to Cook , as well as Mastering the Art of French Cooking and Volume 2 , and put together a little Pinterest board. We always remind each other that takeout is an option, but I so rarely get to cook new things, since the childrens' palates are somewhat limited. The wrinkle is that it needs to be vegetarian, which isn't that much of a wrinkle. I'm thinking French: gougeres (make-ahead! ), pissaladiere (onions and dough in advance, bang in the oven a few minutes before the ladies arrive; roasted pepper strips instead of anchovies for the veggie one, and the little fishies for the other) and salad, and an ersatz dacquoise (really more of a pavlova with ice cream - there's a little Nigella Lawson inspiration in there somewhere) for dessert. BTW, have you read Wolf Hall ? Love it, and Bring Up the Bodies , too. Consider my hair. Cut? It's never more than a trim, and I have yet to find a salon or stylist that really does it for me here. Color? I used to do a semi-permanent box color every once in a while to blend in the grey (which has been coming in for 20 years now - sigh), but every hair color that I checked at the drugstore the other day has propylene glycol in it, which I am allergic to. Bleurgh. Work out. Rejoined the gym today and am looking forward to a run on the track tomorrow. Decide on my next knit design project. I've got a few submissions out there, but I'm thinking of doing something for Knitty. Their First Fall submission date is March 1st, which could work, if I can figure out what I want to do (see #5). Oh, right, grade the Bloc pattern, get it to tech editing and pattern testing. Decide if I'm going to visit the VKL Marketplace this weekend. It can be dangerous - there's usually some good stuff there. Maybe if I stopped hoarding that cashmere I got two years ago, I could get more! See about doing some trunk shows. There are quite a few LYSes within driving range, and I have almost all of my samples. What do we think? Lucky 13 seems like enough to be going on with. 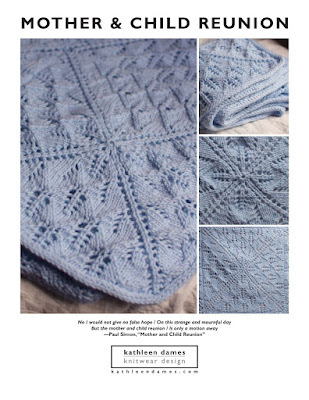 An Aran for Anne download available! For those of you waiting for An Aran for Anne to be available as an individual download, the wait is over! You can find it on Interweave's site here for $6. In case you want to see a more fitted version (the JAK model is lovely and perfect for JAK and too petite for a me-sized sweater :) here I am "working it" for the camera. Goodness, gracious, where have I been/what have I been doing? Apologies for the blog silence. I've been busy/sick/blah/what-you-will. All last month I worked three mornings a week at the preschool, which doesn't *seem* like that much more than one morning a week. But it was. And all that extra time with the small fry (which was super fun - don't get me wrong) led to my getting really sick ten days before Christmas. Now, my doctor said that if I got sick after getting my flu shot that it had nothing to do with the flu shot, but I'm not sure I believe her. Anyway, I spent the weekend in my pajamas moving from the couch to the bed and back again being absolutely miserable. Just goes to show that I am not a good sick person, since I may have been a bit whiny. Thank goodness I hadn't planned to make many Christmas gifts this year, since I knew I would be working at the preschool. But I did knit up some cozy hats for my BFF's boys, another hat (beanie version of Night Watch Cap) for my Dad (since last year's ended up simultaneously too big and too small), and a My, Dear for my Mom, who is quite the deer lover. Ooh, there was a Captain Austen's Scarf, too, for Nick (with no fringe), but I finished that early in the month. And I had test knit my Castaway in a lovely green wool-silk blend for my sister back in early November. Hmm, I did knit more gifts than I thought I had! But I didn't have last-minute knits, which saved me from stress and last-minute-ness. I love this sweater! In fact, I made a second one. This one is also my Superstorm Sandy sweater, since I finished the bulk of it around the time Sandy hit New York. I couldn't do much of anything besides watch the news coverage and knit round and round. I sort of test-knit my size on the second Bloc and will be working on grading the pattern this week. In the meantime I've submitted some ideas to magazines and have finished up the pattern editing for a couple of sweaters (thanks, Ruth, for your mad editing skillz!). If you're interested in joining the test knits for these, check out the threads on Ravelry: Mermaid's Cardigan and Sailor's Valentine. More posting to come - promise!